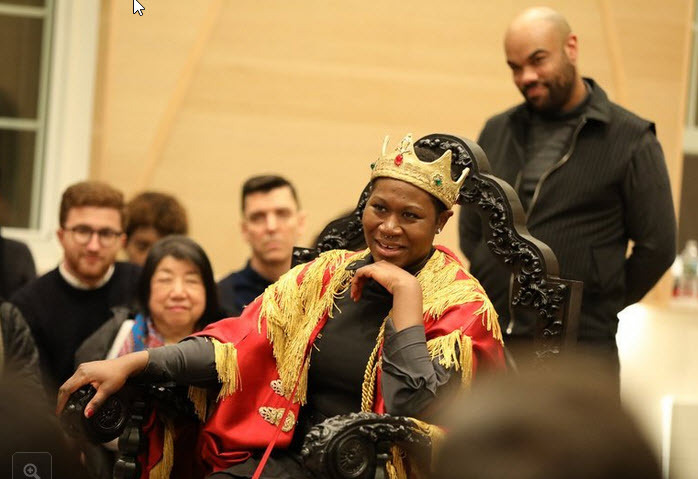 Mr. O’Hara’s most obvious intervention is the casting of the engaging Zenzi Williams, an African-American actress, as Henry, a canny move that makes us ask some useful questions about whom we expect to see leading an army and rocking a crown. Ms. Williams can do both, handily. It’s unclear whether she’s playing the part as male or female. It’s extraneous, too. Gender doesn’t seem to matter to this production. The fact that a black woman is playing a historically white King role is “extraneous”. We’ve got race and gender fluidity covered. Next comes Patriarchical Power! What does ultimately matter is power — who has it, who wants it, how to wield it. If Ms. Williams’s Henry is an inspiring leader when victory seems anything but assured, the actress transforms into a much more worrying one once Agincourt is won. (What’s that thing about power corrupting? Oh. Right.) The wooing scene, usually played as a sweetly comic cool-down after the heat of battle, isn’t sweet here, as Henry asserts his battle-born authority in violent and abusive ways. Too bad Princess Katharine lived before #BalanceTonPorc got going. #BalanceTonPorc, by the way, is the French version of #MeToo. Keep in mind: This isn’t in the NYT’s op-ed pages, it’s in their Theater Review section. But is there really any difference anymore? This entry was posted in Culture Wars. Bookmark the permalink.